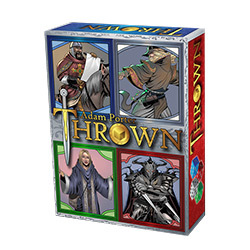 In January, WizKids will release Adam Porter�s Thrown, a dice game with elements of trick-taking card games. Like many classic card games, Thrown challenges players to win tricks by playing the highest score or playing a �trump� when they are unable to �follow suit.� The twist here is that players are not using cards, but rather rolling dice of various colors to win their tricks. Dice can also be used to activate special abilities that can manipulate the dice results, allow re-rolls, or even grant automatic wins if certain dice combinations are rolled. Trick-winners are awarded with gold tokens, and at the end of the game the player with the most gold wins. Thrown comes with 40 dice, 26 ability cards, 4 cubes, and gold tokens. It is intended for 3 to 5 players, ages 14 and up, and takes about 45 minutes to play.